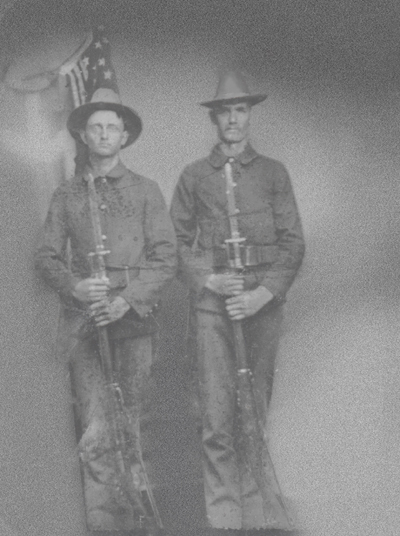 Norman Jason Dunton (1876-1943) served in the U.S. Army during the Spanish-American War. Family history states that he made sergeant before returning to civilian life in Billings, Missouri. He was buried in uniform, with full military honors, in the Orange Cemetery, near Aurora, Missouri. He is the man on the right in the photo. Born 1 November 1890, Detroit, MI. School of Military Aeronautics, Austin, TX 1917-1918. Air Corps Tactical School, 1938. Flying Cadet, 1917-1918; commissioned Second Lieutenant, Air Service, August 1918. Career assignments include: various duties as company and field grade officer, 1918-1942; Commanding Officer, San Antonio Air Depot, 1942; Commanding General, North West African Air Service Command, 1942-1943; Deputy Chief and later Commanding General, Air Service Command, 1943-1944; hospitalized 1944-1945. Retired March 1945. Died 14 April 1967, Fort Sam Houston, San Antonio, TX. Official papers relating to Dunton’s Army Air Forces career. Includes final report of study on Army Air Force Air Service Command payroll system (July 1944). Also includes messages, maps, news clippings, and photographs relating to the rescue of General Nathan F. Twining (January-February 1943). Contains technical orders on Instrument Flying, Airplane Pilot Officer List (1918), Army Directory (1943), Air Force Register (1966), Air Force General Officers List (1966), American Heroes of the War in the Air by Howard Mingos and The Eyes of the Army and Navy by Albert H. Munday. Includes various news clippings and photographs of Dunton including those relating to the construction of the first Air Ambulance which Dunton supervised (1921-1944). Also includes Dunton’s pilot log books (1917-1935). Related materials located elsewhere in the Document Collection, Air Force Historical Research Agency include a Report of Air Service Command Facilities in the British Isles (1942), a resume of Dunton’s military career (1942), and a reference to Dunton in General Earle E. Partridge’s oral history interview (1974). Harold F. Dunton5, born 1889 in Detroit, Michigan. Listed as a Shelby County, Tennessee veteran (page 1156 of index) and an officer. James G. Dunton, Retired Army major and World War I veteran who served as a sergeant in the Ambulance Corps. Click here for a bio and obituary. William Dunton, 39 Grafton St., Grimsby, (North East Lincolnshire, U.K.
Edgar Frank Dunton, Midshipman Edgar Frank Dunton, son of Mr. and Mrs. E. F. Dunton, Corsicana, Texas, attended University of Texas Medical School. Entered service with Army Air Corps, 1942, reenlisted with Army in 1943, enlisted with Navy in 1945, trained at Camp Walters, Sheppard Field, Fresno, Barksdale Field, Brooke Gen. Hospital, Columbia Univ., N.Y. Duty in Midshipman School, N.Y.
Norman J. "Joe" Jackson (1927-1999), served in the US Navy in the occupation forces in Japan. He was the grandson of Norman Jason Dunton. Michael L. Dunton, SSgt (USAFR), 349th AMS (Automatic Flight Control Systems Specialist), Travis A.F.B., California. Served from 9/1980 to 9/1986. 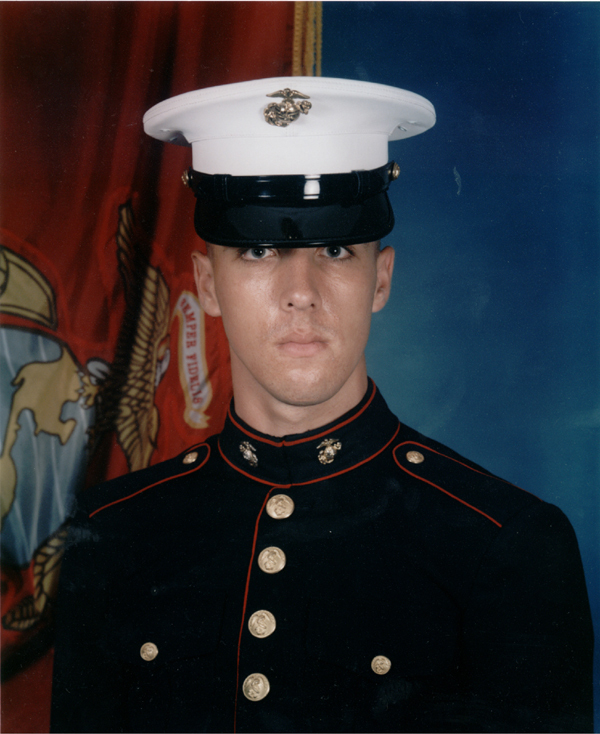 Paul E. Jackson, Jr. (great-great-grandson of Norman Jason Dunton), CPL USMC, received infantry training at Camp Pendleton, California in 2002. He was called from reserves in 2003 during Operation Iraqi Freedom and went with Kilo CO 3/23 USMC in January, 2004 to Baghdad, Iraq. These Marines replaced the National Guard unit involved in the notorious Abu Ghraib Prison scandal.